Not long after Enix released Dragon Quest V for the Super Famicom, they decided to blow the dust off of the first two games from the series and give them a face lift. Not only did they boost the graphics from the original 8-bit art to a more polished 16-bit look, they addressed several issues surrounding level balance and pacing. Several years later, Enix once again decided to release the first two games as a package for the Game Boy Color, allowing a younger generation of players to experience the series from the beginning. 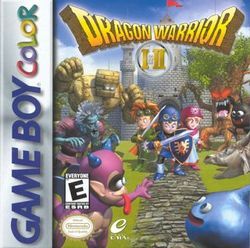 Since the GBC was not as graphically sophisticated as the Super Famicom, the graphics slid down in quality a bit, but was more in keeping with the evolved style of the Dragon Warrior series than the original NES version. This page was last edited on 1 February 2012, at 00:54. This page has been accessed 26,621 times.